Within a solitary moment, Marie Monville realized that life as she knew it was over. 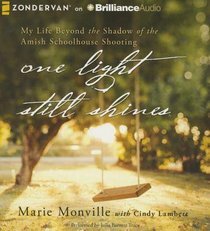 On October 2, 2006, Marie Monville's husband entered an Amish schoolhouse in Lancaster County, Pennsylvania, and shot ten young girls, killing five of them, before turning the gun on himself. The event shocked the nation and left many staggering under the weight of such tragedy and evil. Marie was overwhelmed. What she never anticipated was a tangible encounter with God reaching into her circumstances, rewriting all she believed about herself, her faith, and God's ability to forge beauty out of life's ashes. One Light Still Shines reveals three love stories: the innocent love of a devoted wife for a husband in pain; the incomprehensible love of God in the aftermath of massacre and destruction; and the redemptive love of Christ, waiting to unfold in the life of every person who listens to this audiobook. Marie's journey since that darkest of days has been invaded with light that shines through into the darkest questions we all face--questions about our past, our value, our identity, and our powerlessness in this fallen world. Come face-to-face with the power behind every answer--a love that begs to be received. About "One Light Still Shines (Unabridged, 7 Cds)"